This is the second case study in a series on territorial tax systems in other countries. The intent of the study is to see what lessons the U.S. can learn from other countries’ experiences and to evaluate the validity of some of the fears critics express when discussing what would result if the U.S. were to move to a territorial system. 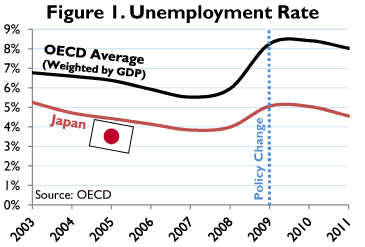 Since the policy change in 2009, Japan’s unemployment rate has trended downward, similar to the OECD average (Figure 1, above). Relative to ten years ago, Japan’s unemployment rate has been reduced, contrary to the U.S. or OECD averages. In addition, economy-wide wages have picked back up after a sustained drop off from 2006 to 2009 (Figure 2). 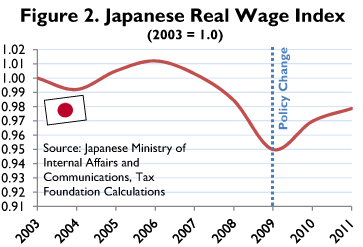 These phenomena are not entirely attributable to the territorial system, particularly because of Japan’s concurrent struggle with the strength of the yen, the global recession, the beginning of recovery, and the 2011 tsunami, but the tax policy transition itself has certainly not dealt an obvious blow to the Japanese labor force. 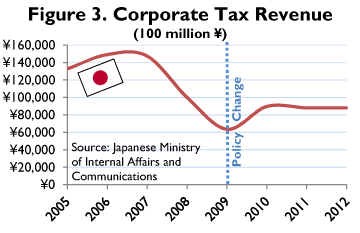 Regarding corporate tax receipts, the Japanese government reports that it increased collections in 2010 and projects that receipts will remain stable for fiscal years 2011-2012 (Figure 3, below). 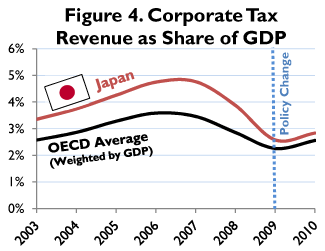 The OECD also reports that receipts ticked up as a share of GDP in 2010, and Japan’s score remains higher than the OECD GDP-weighted average (Figure 4, below). Though corporate tax receipts are sensitive to a host of factors, particularly growth in the economy, it appears that the territorial system has not caused immediate erosion of the tax base. What do these data tell us? In the first three years of the new territorial taxation policy in Japan, not one of the popular fears has become a reality. While outbound FDI is up from 2009, this is by the design of Japanese policymakers; foreign investment represents new growth opportunities for the domestic Japanese economy as its companies engage the world marketplace. The unemployment rate is down, wages are up, and corporate tax revenues have remained stable. This is antithetical to what opponents of a U.S. territorial system might expect. Joint Committee on Taxation, Economic Efficiency and Structural Analyses of Alternative U.S. Tax Policies for Foreign Direct Investment (June 25, 2008), at 49, http://www.jct.gov/x-55-08.pdf [hereinafter JCT, Economic Efficiency]. See Miyatake, supra note 1, at 3. See JCT, Economic Efficiency, supra note 3, at 49. See Thomas Statement, supra note 2, at 2. Joint Committee on Taxation, Background and Selected Issues Related to the U.S. International Tax System and Systems that Exempt Foreign Business Income (May 20, 2011), at 28, http://www.jct.gov/publications.html?func=startdown&id=2793 [hereinafter JCT, Background]. See Thomas Statement, supra note 2, at 3. See JCT, Background, supra note 8, at 28. See Thomas Statement, supra note 2, at 4.